The fixture emits glare-free, soft, comfortable downward light. The shade design ensures even illumination of the surface. The matt upper surface diffuses the light, while the shiny lower surface ensures optimal reflection. ... environments. Its versatility is remarkable and difficult to find in products of this category. This family consists of a table lamp, floor lamp, ceiling, pendant retail and pendant big format. ... shapes which can be used either individually or in groups of three or more units according to client’s needs. Tibeta includes a led module inside, which provides direct bottom light. 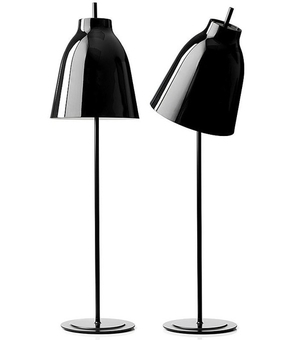 Swivelling free-standing lamp in 8 mm high-temperature fused glass. Black painted metal frame. Diffused lighting with LED system. Table lamp in 8 mm-thick curved transparent glass. Provided with lamp. Brill aluminium lamp holder. This noise-reducing pendant accommodates the demand for both sound absorption and light. By having this original standing lamp full of personality, you can illuminate your conversations while preventing curious glances. The solid wood top of our lamp contrasts with the metal base which is available in a selection of finishes. Table and floor lamps that allow different combinations of varied 100% cotton shades with polished or brushed metal feet. A metal lamp may be designed for interiors or exteriors. Its advantages include fire resistance, ease of maintenance, robustness and a wide range of forms. Some also offer aesthetic qualities. Certain models increase light intensity through the use of reflective materials, while others have attractive decorative finishes or coatings, adding interest to the decor. On ArchiExpo, these items are arranged by properties such as style and installation method. Such lamps are found in domestic, commercial and public settings, both indoors and out. Examples include an adjustable task lamp for a desk, a built-in kitchen ceiling fixture and a floor lamp for reading in a living room. Metal is also particularly suited for use in stage and other lighting producing significant heat and risk of fire. An outdoor metal lamp may add a touch of style or increase safety at night. Ensure that the lamp's maintenance, installation and stability characteristics are suitable for its intended use. Some have reflectors or polished surfaces to increase light intensity. Others offer adjustable height, direction and head position. Outdoor models may have special weatherproof, corrosion-resistant finishes. Lamp style should be determined with respect to the surrounding decor. A metal lamp with streamlined finish may work well in a minimalist space, while a cast iron piece with a traditional lantern is more appropriate in spaces with a period or traditional ambiance.